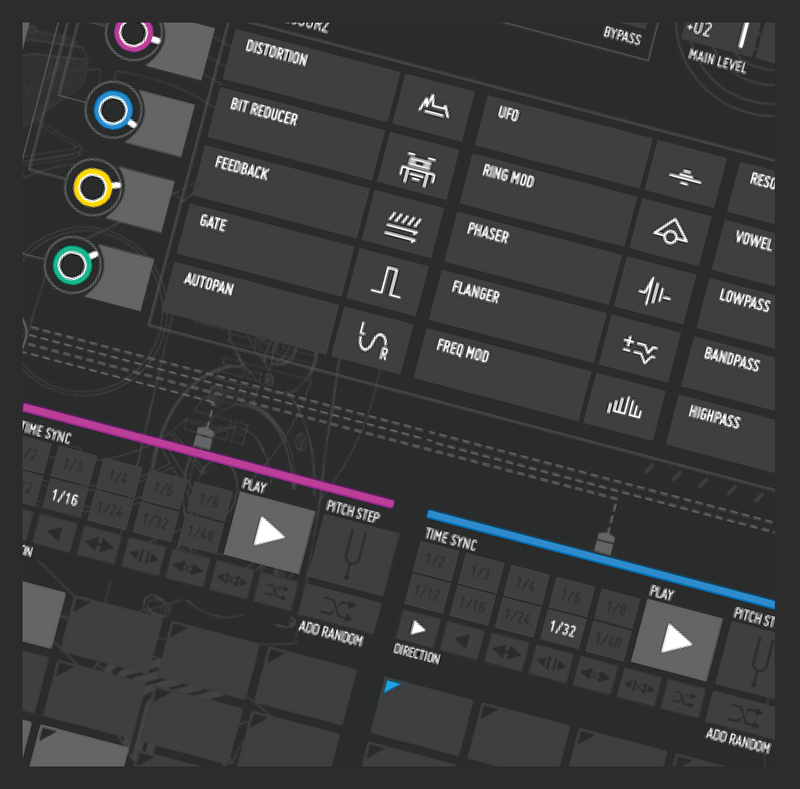 SUBSTANZ° – GrooveBox & Finger Drumming Platform. 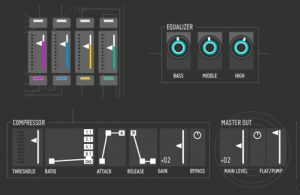 -> A complete arsenal for performing modern beats with only 4 tracks. Less is more ! 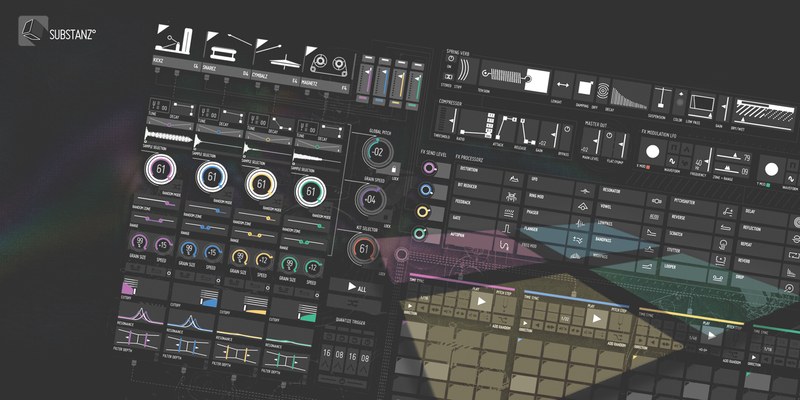 -> The perfect crossover between a groovebox and a finger drumming platform. Recycle ideas in the studio and get pro-actively inspired during live sets. -> A collection of multilayered sound material. 244 raw files, 128 kits, only wait for being launched by your fingers. -> Smash the whole mix with the FX PROCESSORZ, a wide bus of 25 effects modules that can be instantly triggered via midi. 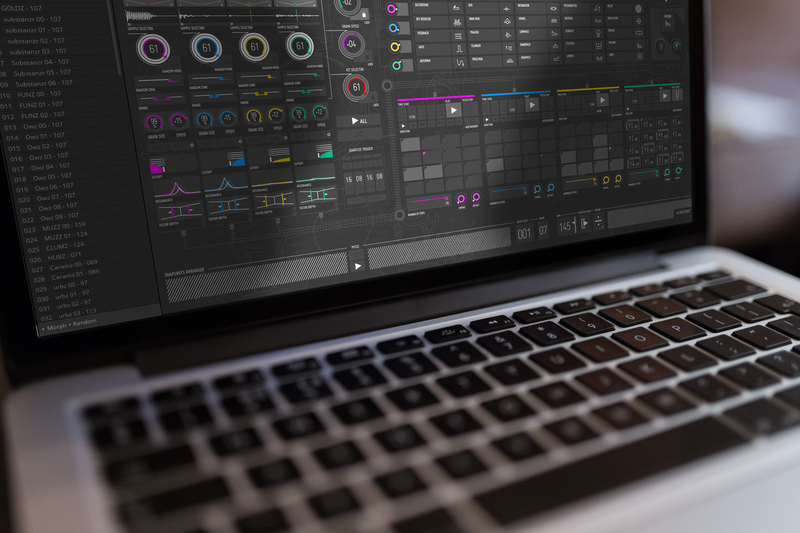 All these features make SUBSTANZ an addictive and powerful beat station for Reaktor 6 that can not leave you indifferent if you are looking for a virtual instrument offering a paradigm of performance, originality and inspiration. – A screen resolution of a minimum of 1920 x 1200 megapixel for a full display on screen of the instrument. SUBSTANZ° measures 1665 x 977 megapixel. – CPU usage : Around 16% and 27% with a 2,7 GHz Intel Core i7, 16G Ram. SUBSTANZ also contains the same concept, previously explored with Blinksonic° RUIDOZ and AETONZ, with a random modes which make possible to define a range of aleatory on each gate events. This process injects a random dose for every sounds launched by the 4 decks. Following this principle, it’s possible to create astonishing and evolving loops on each voices. 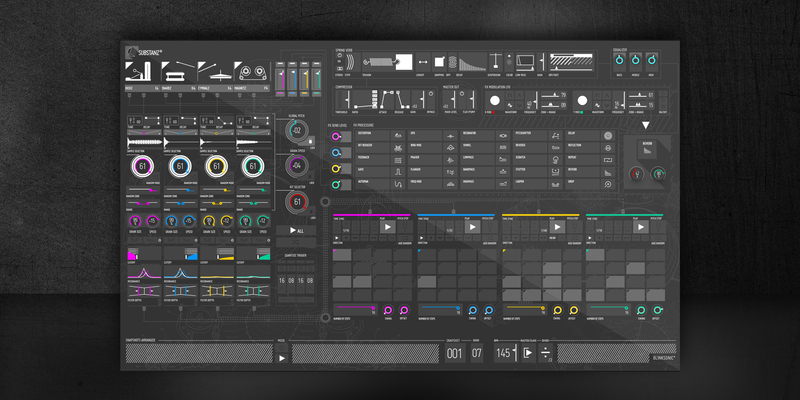 This sequencer will feed the 4 decks with a vaste range of possibilities. Quantization, direction, number of steps, start point offset, swing level.. This toolbox is good enough to create complex rhythms. It is also possible to adjust the pitch on each step. The “random” command is highly effective for creating breaks while playing a phrase. 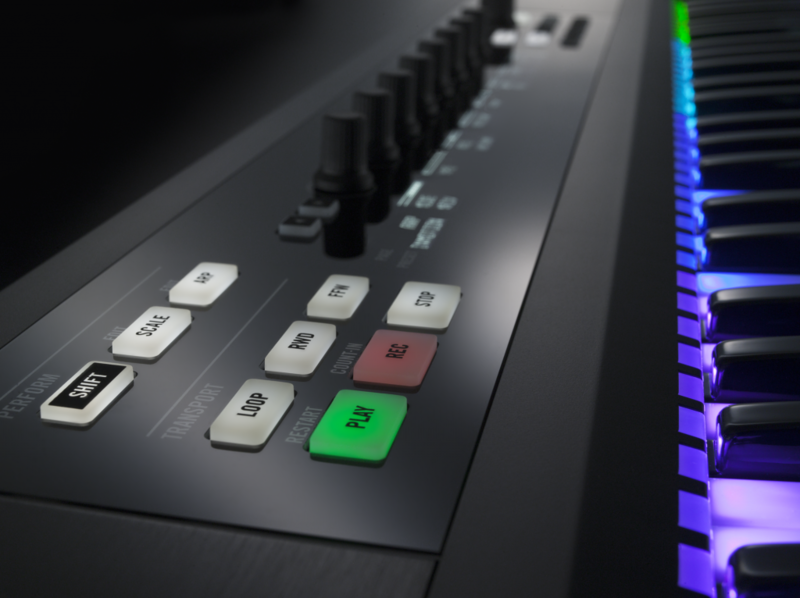 Magic operates even more when the midi controls of each slot are operated in real time because the manual interpretation is printed in addition, while staying within the predetermined time range. Make resonate Substanz° with this famous “boiiinnng”, damped, dulled, and vintage color. Not the most realistic spring reverb ever, but enough interesting to give an exotic character to your tracks. A good one for a virtual acoustic experimentations on drums ! SUBSTANZ comes with a unique collection of samples, based on 61 drum kits which cover various electronic music styles. These drum kits are a subtle reworked of percussive tones from differents rhythm boxes, famous « amen breaks » and vintage acoustic drum parts. «Magnetz» a selection of harmonic audio signals merged with some tom drums, reversed audio slices and other percussive tones. Around 140 snapshots and 128 kits are already included. A revisit of various music style (IDM, GlitchHop, House, Trap, Electro, DNB), it also shows what substanz got in the belly.. . You can use them to make a good start managing this little monster… even incorporate them to your creation. Manage the dynamic of your mix with the included master effect chain : equalizer, compressor & flat/pump limiter. If you like to supercharge your audio out, this cohesive toolset will perfectly do the job. The instrument has been also designed to provide an extensive solution for composition and to subsequently be easily transposed for live use, create a simple rhythmic basis and be able to tweak and adjust without losing the essence of the original idea. The « snapshots arranger » is also available for this. It’s possible to build the skeleton of a song with this module which takes the control of presets and gives an order of execution to all of them. It can also be used as a”lock” function : a snapshot is running, add some twickle and modification and after a predefined time quantization, the snapshot came back to original state. SUBSTANZ° takes advantage of the “Grain resynth modules”, a primary macro which enables to embed external samples. – 4 Sample Decks with pitch, decay, grain size, reverse mode, LP/HP Filter, panner..
– Launch samples with external midi or intern midi sequencers. – Switch easily between this 2 performance modes. – 4 x 16 steps sequencers, with time sync and direction selector. Set pitch per step, Adjust swing, start point and add some randomness to the loop. 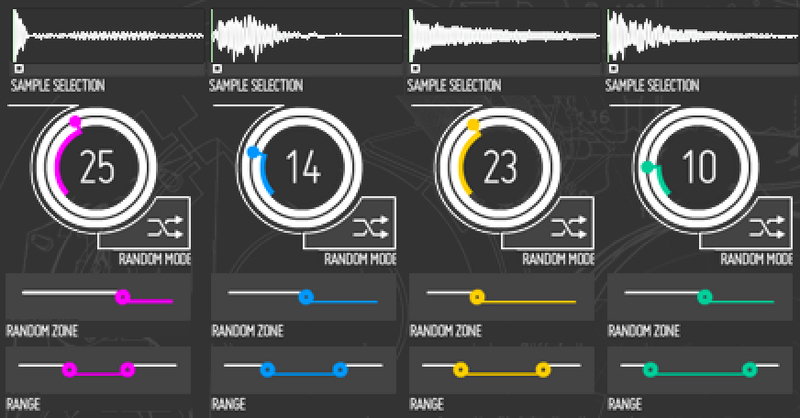 – Quantize these events with the time sync selector for creating rolling drum effects. – 25 effects : Distortion, Bit Reducer, Feedback, Gate, Autopan, UFO, Ring Modulator, Phaser, Flanger, Freq Modulator, Resonator, Vowe, Lowpass, Bandpass, Highpass, Pitchshifter, Reverse, Scratch, Stutter, Looper, Delay, Reflection, Repeat, Reverb, Drop. All can be enable on the fly and adjust by 2 parameters. – Intern BPM/Clock function with Divide button. 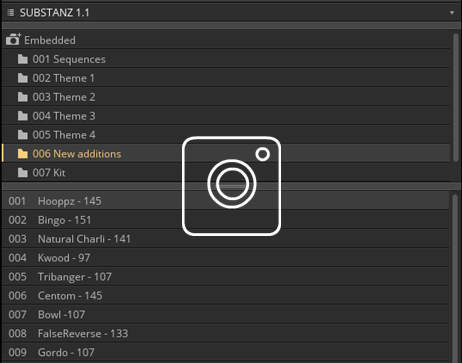 Minimalistic as powerful, Substanz° workflow highlights all the controls you need to put your hands quickly on any parameters. A smaller alternative view is available which just displays the strict essential for performing on a pre builded set of kit and sequences. 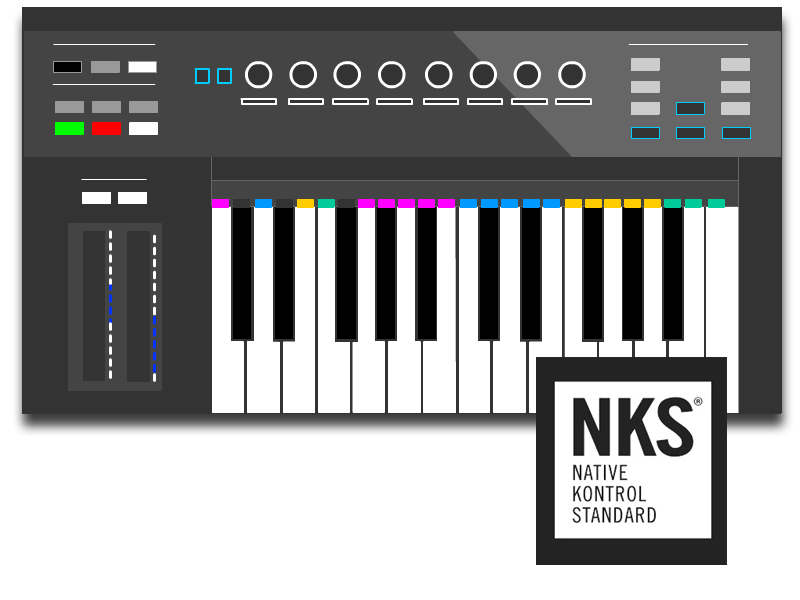 SUBSTANZ° is NKS (Native Kontrol Standard) ready. Distortion >> Bit Reducer >> Feedback >> Gate >> Autopan >> UFO >> Ring Mod >> Phaser >> Flanger >> Freq Mod >> Resonator >> Vowel >> Lowpass >> Bandpass >> Highpass >> Pitchshifter >> Reverse >> Scratch >> Stutter >> Looper >> Delay >> Reflection >> Repeat >> Reverb >> Drop. 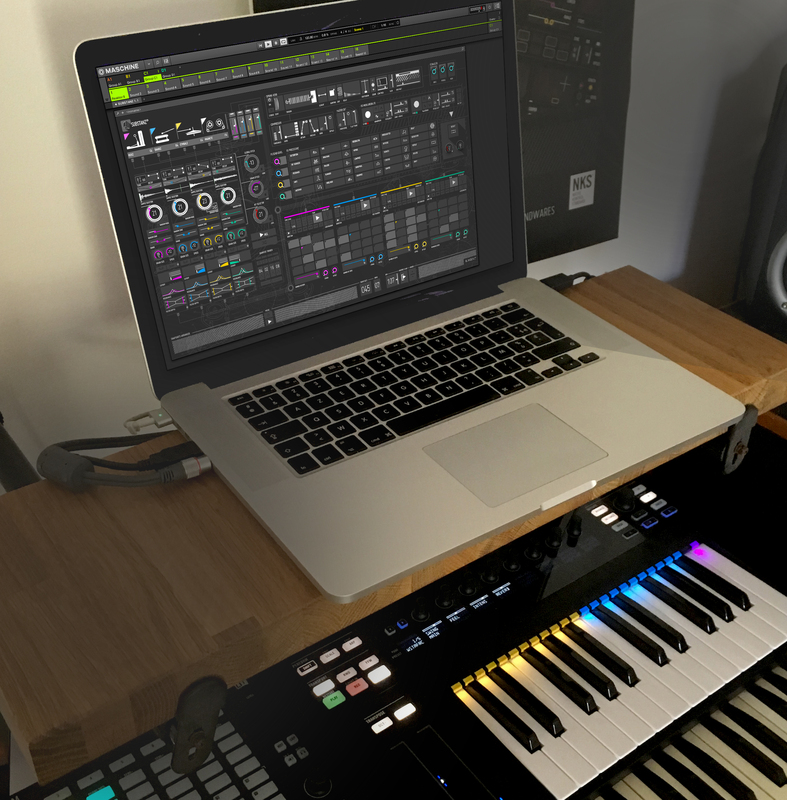 Remix, smash & twist the whole audio in real time and create impressive playable sound mangling. Add glitch movements and make your mix scream. All effects can be launch instantly or in locked position and can receive the modulation of the 2 LFOs. In April 2017, this multi effect has been transposed to the Block framework under the name : PROCESSORZ°. Each effects have 2 basics calibrated parameters which can be controled via the A/B modulations from any devices or sources available inside your block patches. To get a bonus of expressivity, this modulation events can be turned on and off via MIDI, the same way you press on effects buttons. PROCESSORZ° can be plugged to 4 different stereo sources inside your block. The effect dose of each tracks can be parameter with the 4 sends control knobs. It also works pretty well as a plugin effect inside your DAW (Ableton Live, Maschine). 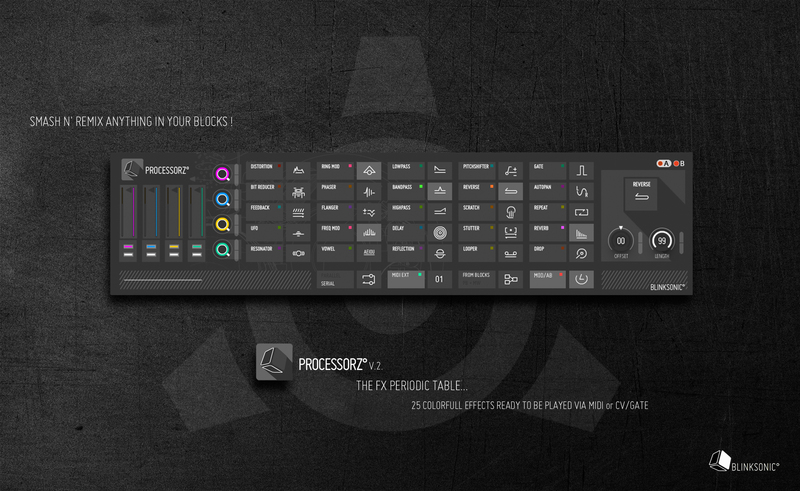 PROCESSORZ° is minimalist as powerful for adding some vibrant audio events and changing dimension of any sounds. Many combinations are possible with this kind of FX periodic table. 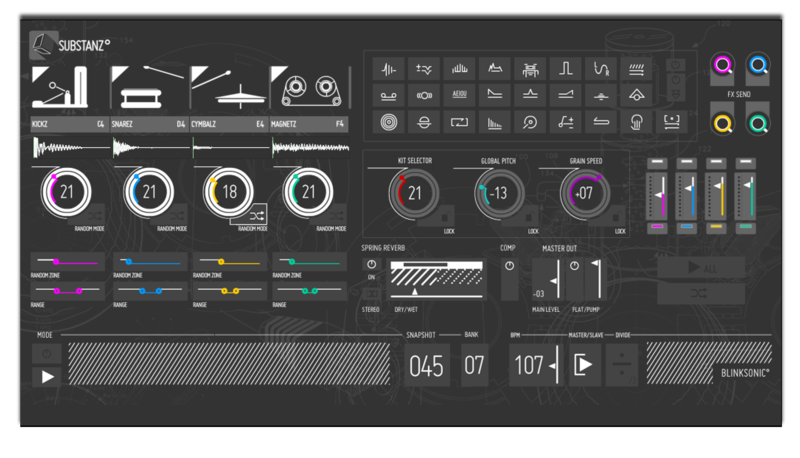 You can download it for free, connected to the Reaktor User library.